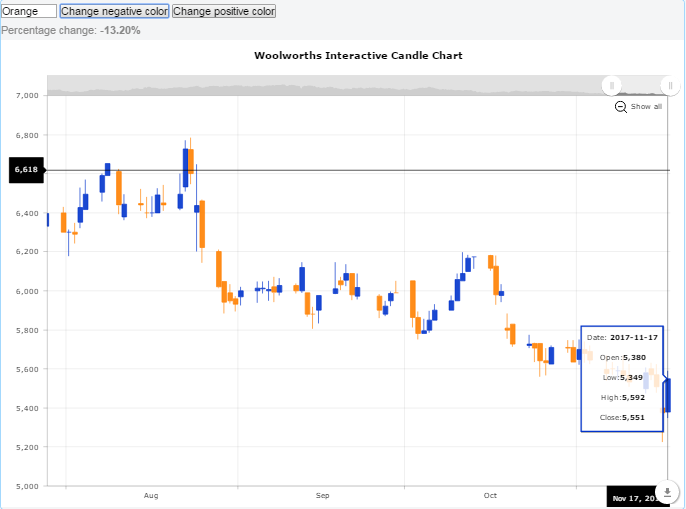 In today's blog we take a look at South African retail giant Woolworths's latest trading update. And the numbers (especially those in Australia does not inspire confidence for Woolworths (WHL) share holders. In South Africa, Woolworths Fashion, Beauty and Home (previously Clothing and General Merchandise) sales increased by 0.7%, with price movement of 0.9%. Sales in comparable stores declined by 2.4%. Trade was affected by the macro environment, which negatively impacted consumer sentiment and discretionary spend. Retail space grew by a net 4.2%. Woolworths Food sales in South Africa grew ahead of the market, up 9.3%, with price movement of 4.5% and positive volume growth. Sales in comparable stores grew by 5.3%, driven by price investment and our ongoing focus on product quality and innovation. Retail space grew by a net 8.2%. David Jones sales declined by 5.3% and by 5.2% in comparable stores (in Australian dollar terms). Sales growth was impacted, but gross margin was protected, by the pull-forward of the end of season winter sale into late June and a reduction in promotional activity throughout the period. Key concession brands also reduced tactical campaign activity in David Jones to reduce discounting. Disruption caused by the refurbishments of the Bondi Junction Food Hall and the Elizabeth Street store, as well as from the implementation of the new inventory management system also impacted trade. Sales in the last six weeks have shown an improving trend. Retail space reduced by a net 2.2% as we continue to drive space optimisation. Country Road Group sales increased by 8.3% in Australian dollar terms. Sales in comparable stores (which excludes Politix stores acquired in November 2016) declined by 0.4%, although market share has improved. Trading space reduced by a net 2.0% during the period (excluding Politix). We opened eight new Politix locations within David Jones stores and are seeing positive results from this initiative. Below the candlestick chart showing WHL share price for the last 4 years. From the interactive chart above, it shows year to date (YTD), the WHL share price has decline by almost 22%. And the trend has been mostly negative with only a few short periods of share price gains. This constant downward trend in a share price does test the patients and nerve of investors and even though a share might offer value when it keeps declining like this it hard for investors to remain patient and invested in a stock when it performs like this. So lets unpack the trading update provided by WHL. Group sales (which includes all brands in South Africa and Australia) increased by a mere 2.6% (3.1% in constant currency terms). That is exceptionally low growth in sales. Well below the current level of inflation experienced in South Africa. Woolworths Food however came to the rescue of Woolworths in South Africa. With sales growing by 9.3% and inflation of this category at 4.5%. Sales growth was more than double the inflation rate in this category, which shows strong sales growth and possible market share increase in this sector for Woolworths compared to Spar, Pick 'n Pay, Shoprite etc. Below a technical analysis chart of WHL share price for the last 4 years. Again the chart is highly interactive and users can adjust and edit the graph as they see fit. A further discussion on WHL's trading update follows below the chart. The real problem for WHL is not really in South Africa, but their operations in Australia. David Jones (their main brand in Australia) sales declined by 5.3% (and by 5.2% in comparable stores). That is a significant drop in sales. Luckily for WHL investors the Rand's performance against the AUS dollar has been rather poor, softening the blow of poor sales at David Jones, as sales reported in Rands will be boosted by weaker Rand against the Aussie dollar. For more on the Rand/Aus dollar see our Rand Dollar Exchange Rate page. However investors cannot depend on a weak Rand to soften the blow of poor sales in Australia forever. WHL also mentions that two of David Jones' main stores (both located in Sydney) were impacted by refurbishments of either the store or the mall they are in. Country Road which is a smaller Australian operation showed strong sales increases in Aussie dollar terms (8.3%). Sales in comparable Country Road stores declined slightly (0.4%), but WHL states that market share has increased, which tells us that the sector at large has been experiencing extremely difficult trading conditions, as a decline in comparable sales still lead to a market share increases, which says the rest of the companies in the sector had even bigger sales declines. Woolworths will release their results towards the end of February 2018. We will do a new stock valuation on WHL as soon as their results are available. The current WHL results review and valuation can be found here.